Co-presented by Sydney Dance Company and Carriageworks, with support from the Balnaves Foundation, "New Breed" is now in its fifth season. It’s an important program because each year New Breed gives several choreographers the space to create a short new work, the dancers with which to do it, and a professional performance space and short season in which these works are presented to the public. 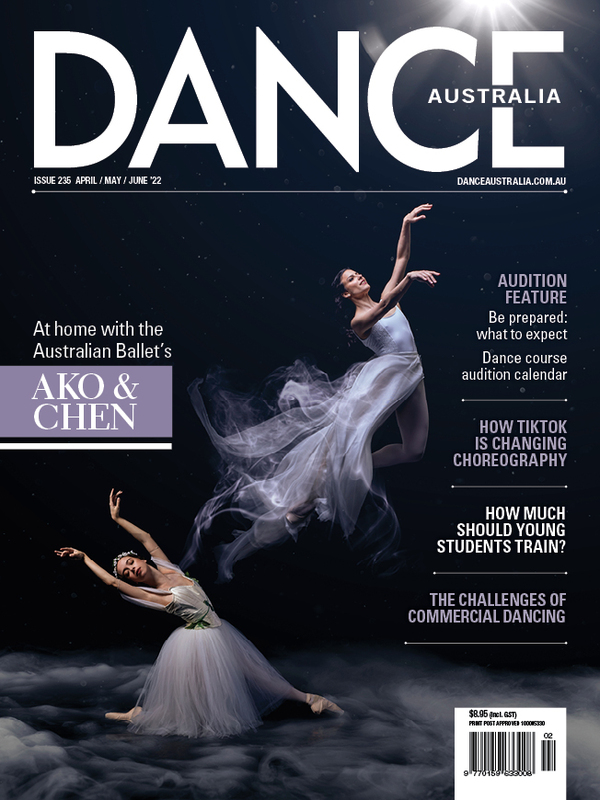 This year, the four chosen choreographers were all women, and it was a stylistically well-balanced program with two slightly longer works choreographed by Prue Lang and Katina Olsen (both independent artists); and two slightly shorter works by SDC dancers Janessa Dufty and Holly Doyle. Each work was performed by a cast of five to six dancers, paired with an original musical composition, and accompanied by lighting and costume designs by Alexander Berlage and Aleisa Jelbart respectively. While Prue Lang’s Towards Innumerable Futures and Holly Doyle’s Out, Damned Spot! are shaped by completely different concepts, both share a driving musical pulse and emphatic rhythm that is reflected in the movement. Towards Innumerable Futures is set in a technologically advanced future, reflected in the electronic sounds of Chiara Kickdrum’s pulsating score. Both male and female dancers wear short blonde jaw length wigs, fitted leggings, flat sneakers and looser fitting tops – making them appear somewhat androgynous. In contrast, Katina Olsen’s Mother’s Cry and Janessa Dufty’s Telopea are much more lyrical in style. Mother’s Cry has a slow start, but eventually gets going. The cast of six female dancers are costumed in soft, draping fabrics while Cameron Bruce’s score for Mother’s Cry had an almost mystical feel. The all-female cast worked well as a team, with none taking precedence over the other. Janessa Dufty’s Telopea takes its name from the Waratah flower (Telopea Speciosissima) and was touching in its aesthetic and simplicity. Accompanied by a musical composition by composer/singer Tobias Merz (who also performed live, singing alongside the dancers in an operatic style), the deep red of the Waratah is evoked by the colours of the costumes (loose, flowing pants, dyed in graduating shades of pink) and made stronger by the warm colours projected onto the dancers in Berlage’s lighting design. As the only female dancer - surrounded by four male dancers in Telopea - you might assume that Ariella Casu would take centre stage, but you would be wrong. Casu was fantastic, but what is really interesting about this work is the way Dufty’s choreography gives the men a chance to perform lyrically and romantically in their own right, not simply as romantic foils in a male/female duet. Davide Di Giovanni, Bernhard Knauer, Todd Sutherland and Petros Treklis all danced with sensitivity, while choreographically the highlight of this work is the way the dancers, grouped together centre-stage, lift each other in turn, in stretching, unfolding movements that convey the way a flower opens up and responds to sunlight. Next year is SDC’s 50th anniversary and, as such, will be a celebration and reflection of how far the company has come. But I hope that in coming years, more of the choreographers showcased in "New Breed" will be commissioned to develop longer works on the main-stage. The quality of their work demands it.